What’s on your bottom board? As a new beekeeper you often wonder what the bees are doing. Are they building comb? Are they bringing in honey? Is the queen laying? Are they hungry and need food? So many questions. The only way to truly see — first-hand — what they’re up to is to open up the hive and inspect. However, a second-hand view on the hive’s activity is often provided through what you find on the bottom board. What do you have on your bottom board? It is clear that both A and B have been quite active on the left side of the hive, while C more so on the right. Perhaps this would indicate a favourable side due to the way the sun heats the hives during the day. These cornflake-like shells are the wax cappings placed over larvae just after a week of development. Once the bees hatch, these cappings are chewed away in order for the bee to emerge. The glistening shine on the bottom board could indicate a lack of airflow, resulting a moisture build-up. Perhaps it’s time to give them some more air. Previous inspections may have involved scraping off propolis between the frames in order to restore the proper bee space between frames pushed together, or even from cleaning up the frame rests. Or, this could be large wax pieces that fell off after damaging the comb. 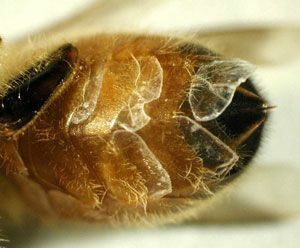 This little arachnid with its eight legs give most beekeepers the creeps — Varroa Destructor. If there’s too many (yes, this is vague) of these on your bottom board, it’s time to launch an assault. When travelling with luggage, airlines somehow loses track of where your belongings went. Bees experience the same travelling woes. These pollen packs allows one to identify the type of forage the bees are favouring at that particular time in season. What colours do you see? Which flowers do you think they come from? Here’s an example of a pollen colour identification chart for a region in Europe. Frosted flakes from capped brood. Crystals from sugar syrup that was not consumed during a feeding session. Bees drink the syrup, but have no effective way of consuming — eating — undissolved sugar crystals. They tend to traipse around it, spreading it around and mostly picking it up with their mouth parts and removing it from the hive. Unclaimed luggage on the bottom board carousal. Another knee? Replacements must be cheap in this colony. Examining the bottom board is like palm reading…? Not really. It gives you some insight into what’s happening without opening up the hive. You still have to investigate to truly see what the critters are up to. Insightful as my neighbours must wonder about me sometimes as I angle my bottom boards into to sun to try to see what’s on them.